The drawer is held in place by two wood screws. The screws attach in the center of the drawer so that you can rotate it to the left or right to access your storage space. Can I install a half circle drawer on an Eco curve desktop? Yes, the half circle drawer is compatible with the Eco curve. You will just want to carefully confirm the placement of the closed drawer before screwing it in to ensure it will remain fully hidden at all times. Yes, there is room on your desk for both the half circle drawer and a keyboard tray. The drawer hangs very minimally under the desktop, while the UPLIFT Desk keyboard trays hang lower. You will still be able to use both of these accessories on your UPLIFT Desk. Will my desk fit two half circle drawers? Yes, unless you have a very small desktop you should have space underneath your desk for multiple drawers. If you are unsure about sizing requirements, just call or chat with one of our sales pros. They will be more than happy to advise you about accessories and configurations. Is this drawer mostly just for pens? 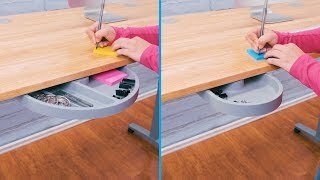 The UPLIFT Desk Half Circle Drawer is on the smaller side, but it is a great place for pens, Post-its, paper clips, or anything else that is fairly small and shallow. It can be a home for all of the odds and ends you don't want cluttering up your desktop. It's your choice on the color of your Half Circle Desk Drawer. Choose from black, gray, or white to coordinate your desk storage with your frame and accessories.